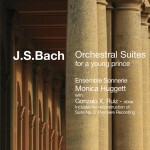 Think you know Italian baroque chamber music? Think again. 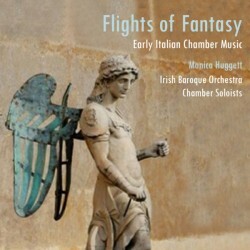 The range, diversity – and even wackiness – is remarkable, as illustrated by Flights of Fantasy, an album of acute inventiveness by Avie stalwart Monica Huggett and the chamber soloists of her Irish Baroque Orchestra. Take Carlo Farina’s Capriccio Stravagante, which translates as “outlandish whim”, and imitates barking dogs, meowing cats and gunfire. More serious, but no less virtuosic, experimental forms occur in works by Marini, Castello, Legrenzi, and Cavalli – the Venetian best known for his operas – all heard on this album. Created in 1996, the period-instrument Irish Baroque Orchestra occupies a fundamental place in Ireland’s musical landscape. 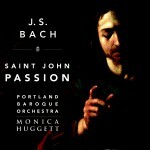 Ten years in, the mantle of artistic director was assumed by Monica Huggett, who has created a decades-long career of critically acclaimed and award-winning recordings, including the Billboard chart-topping, Grammy-nominated Bach Orchestral Suites on Avie (AV 2171). [no tempo indication] – La Lira – Il Pifferino -Lira Variata – Qui si batte con il legno – Presto – Adagio – La Trombetta – Il Clarino – La Gallina – Il Gallo – Presto – Il Flautino pian piano – Forte – Presto – Adagio – Il Tremulo – Il Piferino della Soldatesca, Il Tamburo – Il Gatto – Il Cane – Presto – La Chitarra Spagniola – Adagio, sempre più adagio.